Herbs such as parsley, mint, chives, basil, coriander and dill are plentiful during the summer months. But as autumn approaches their growth will be less prolific and they will begin to die back. To make the most of these herbs all year round, harvest them at their best, wash and chop them ready for use and then freeze them whilst they are fresh. They can then be added to cooking all year round! For a selection of herb seeds to buy click here. If you would like to take part in a scientific experiment in your own back garden why not take part in the great snail swap. With a neighbour all you have to do is each collect snails from your own garden, mark their shells with a little paint and then release them in each others garden. 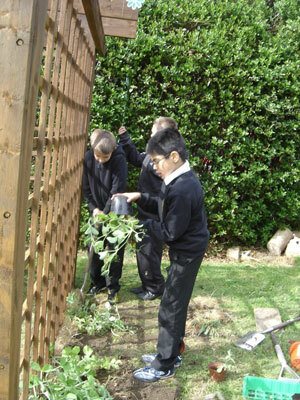 Then wait and monitor both gardens to see if the snails return home. For more details and everything you need to know about how to take part in the great snail swap click here. Most strawberry plants will have sent out runners by now and these easily root into the surrounding soil. To make good use of the new plants carefully transplant them into one of these strawberry tables. Designed to keep your precious strawberries safe from unwelcome predators, the strawberry table can be placed wherever you wish! It simply bolts together. It comes with a moisture mat to retain soil and keep roots moist. Applying some vaseline to the wooden legs will also keep the slugs and snails at bay. If you are growing singe-stemmed tomato plants don’t forget to cut them off at the top as soon as they have around 5 trusses of flowers. This will allow to the plant to put its energy into growing and ripening the existing fruits and will produce a good harvest. Whilst all eyes are on the summer harvesting, it’s a good idea to remember that there are lots of crops, that can be sown in August for harvesting later in autumn, winter and even next spring. Oriental Salad – Sow a few at a time for a spicy salad mix including Red Mustard and Mizuna. 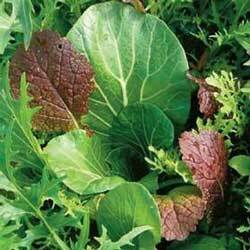 Artic King/Marvel of Four Seasons – Sow a few at a time autumn till spring for hearted winter hardy lettuce. Black Spanish Radish – A large round winter hardy radish with very strong flavour. Rocket – For peppery leaves all winter. American Land Cress – Sow in succession for a good alternative to watercress. …And if you would like new potatoes on Christmas day take a look at our Christmas Potato Selection . There are five varieties to choose from and if sown now, will provide a delicious Christmas treat! 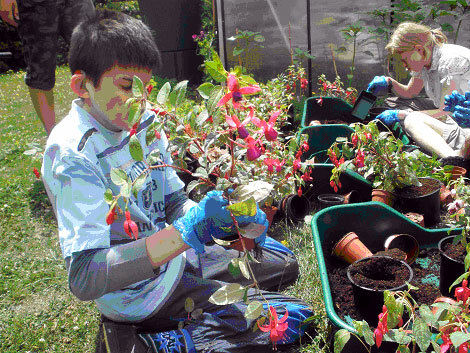 Thanks to everyone who entered our July Family competition where we asked what you were doing to help the environment where you are, over the summer holidays. You are certainly a busy bunch and we loved your ideas. The winner was the Cunningham family from Cumbria. 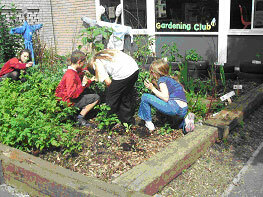 Mum Emma and children Iona, Anita, James and Elena took donated seeds from granny and managed to raise 6 or so sturdy little lavender plants, which they set in their garden to help the bees and butterflies. 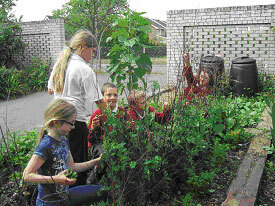 The family have also been taking part in Carlisle’s Love Parks Week and have now decided to start composting! Well done to you all, your prize – a Solar Insect Theatre is on its way and will hopefully get lots of use with all the bug activity your lavender bushes are likely to attract! We received lots of other really great ideas and we have included a few below, and everyone mentioned here will receive a little gardening goody in the post from us, as a small thankyou! “We leave a corner of the garden wild and encourage thistles and nettles. I’ve done this and the amount of butterflies that is has encouraged is amazing. If you would like to enter our August competition click here for all the details. Enormous thanks to everyone who entered our July Schools competition. 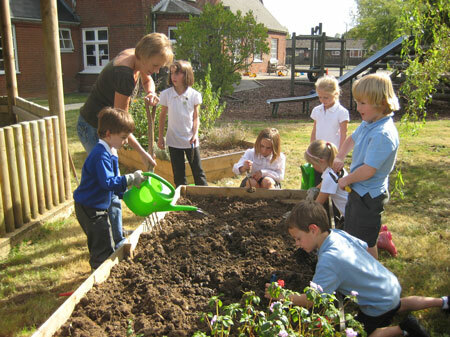 The winner was Ilketshall St Lawrence Primary School in Suffolk for their photograph taken during the making of their sensory garden. Their prize – a bundle of bird feeding goodies available at Recycleworks, will be a great addition to the school garden in the autumn term. We had so many lovely entries , it was so hard to choose. Do have a look at a small selection…. and thanks to everyone who took part. 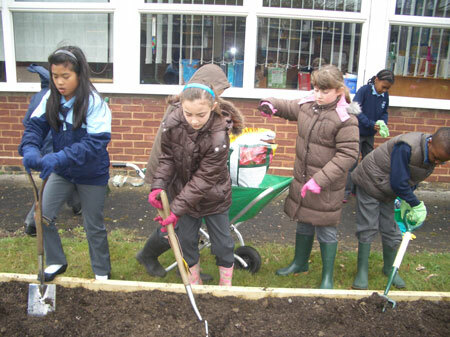 All the schools featured here will receive a little gardening goody in the post from us, which we hope you will enjoy. If you would like to enter our competition for August please click here for all the details. 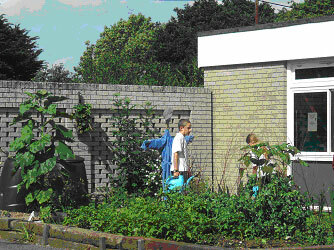 Children gardening at Lockyers Middle School, Dorset. 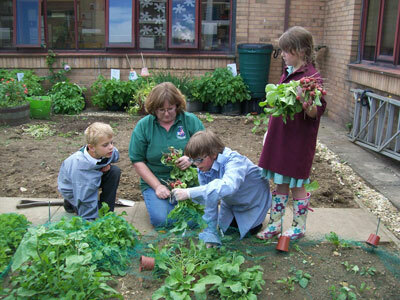 Above: Harvesting the radish crop at Heckington St Andrew’s Primary School. 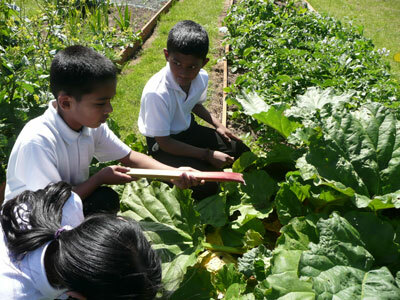 Above: Harvesting rhubarb at Knowles Junior School, Bletchley. 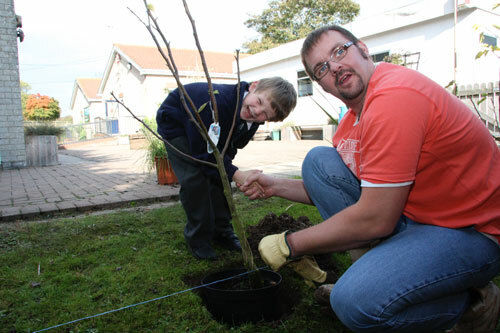 Above: Father and son have fun planting an apple tree at Wold Newton Foundation School, East Yorkshire. 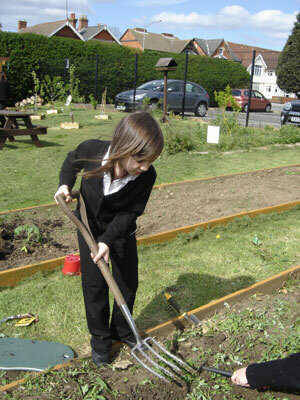 Below: Preparing the beds for planting at Our Lady Catholic Primary School, Welwyn Garden City.